Of course these pictures don't match the current snow/slush conditions. Sunday afternoon was a great time to walk up 9th from Smith Street - barely a soul around, and the light snowfall brought a gentle gravity to everything it touched. Those reds & yellows too (I fall for them so easily)- muted & bright at the same time. The snow reveals its hidden treasures. Outside the former OTB. I'm getting absurdly fond of this taxi stationed at Eleventh & Fifth. With Timboo's in the background, it looks better than ever. The snow plows were towed away shortly before dawn, leaving a portion of the street above Fifth passable to traffic. This state of affairs seems almost maliciously designed to lure innocent (or stupidly naive?) drivers up the street, only to find their vehicles stuck in two feet of snow. Most people seem to have managed to back down to Fifth after a certain amount of shoveling, but right now there are two cars firmly entrenched. Here are a couple of shots of the two types of street terrain. Oh & here's the pristine version, early yesterday morning. We still have a pair of snow plows stranded on our block, with sanitation guys (in shifts?) guarding them. This afternoon my next door neighbor took them some food. All over the city, it seems, there are drivers minding vehicles. I've seen more than one bus driver asleep at the stationary wheel. I'm amazed by the lack of plowed streets around here - even the avenues are filled with snow and hazardous to drive. On the other hand, if you want to see Bloomberg's block, the NY Times City blog has a shot of it taken this afternoon. Not too much white stuff there. At seven this morning, the streets were quiet. There was little evidence of street plowing, as most of the plows in evidence were themselves stuck in the snow. There are two sitting idle on my block alone, and a myriad of buses, taxis and cars are stranded around the neighborhood. Usually when it snows in the city you can get along on foot pretty easily by walking in the street, but today this isn't much of an option on the side streets, and a lot of the time this morning the snow came way above knee level. If ever I needed Wenceslas to hang out with, this would be the time. Earlier this week I sat on a bench next to the "Newspaper King", at the West 4th Street station. As I sat there, waiting for the F, he was taking pieces of paper and twisting & incorporating them into the sleeves of his costume. What otherworldly crazy artistry in those designs. See an April Walkers in the City for a photograph (& another great essay). Oh look, there goes the former Taco Nuevo Mexico building. As for the OTB site, I was again informed by a construction worker that a "store ... supermarket" was going in there. That's kind of vague. 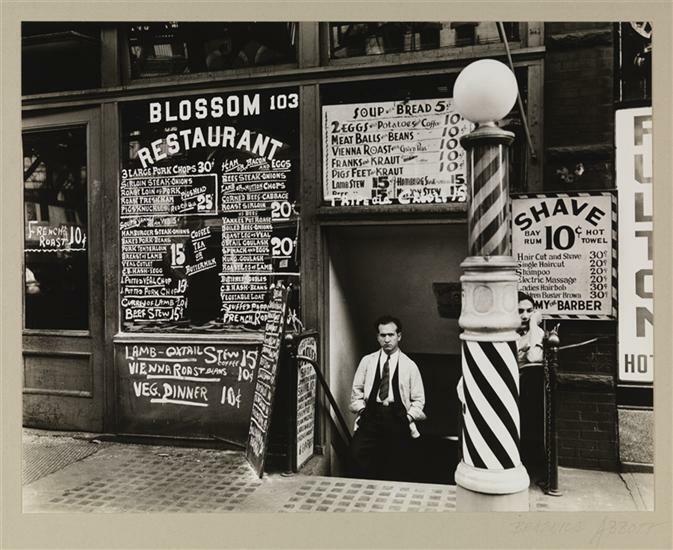 Here's another Berenice Abbott, from October, 1935. This is of the Blossom Restaurant, in the basement of the Boston Hotel, at 103-105 Bowery. 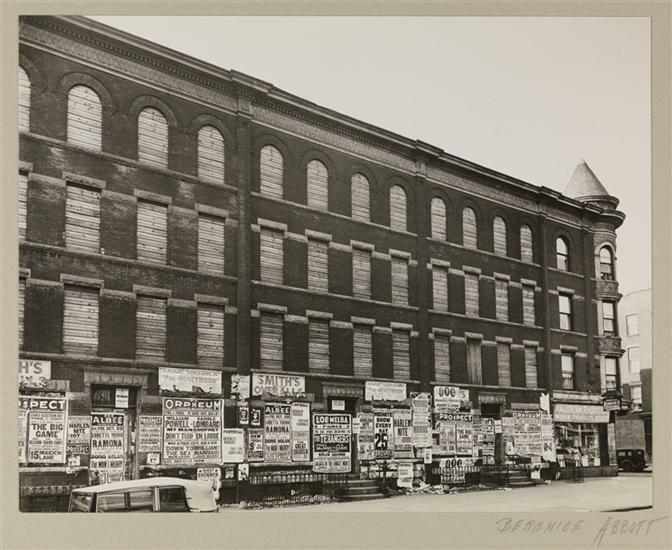 There's been quite a buzz online today regarding the Museum of the City of New York's uploading of historical city photographs onto its website. Plenty of blogs have been discussing the release and displaying images. 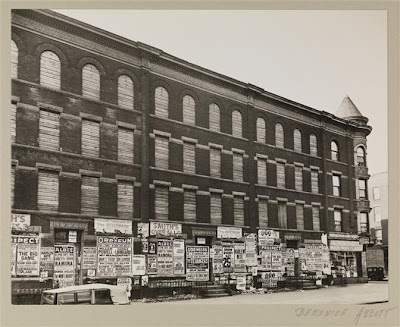 I haven't had time to dig very deeply into this treasure trove, but this 1936 Berenice Abbott shot, of "abandoned old-law tenements, at 154 Fourth Avenue between Butler and Douglass Streets", is pretty great. Look at all those movie ads!